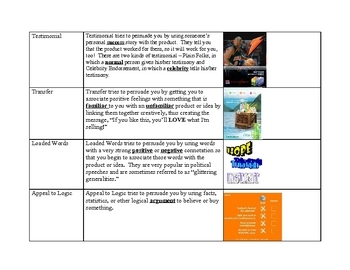 For each technique, the notes contains the definition of the persuasive technique, along with an example from advertising. 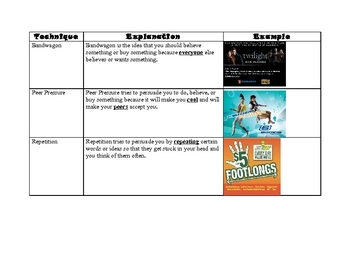 The ads featured are from products students are familiar with, such as Sketchers, Gatorade, AT&T Wireless, and Subway. Students will appreciate the connection to their everyday life! 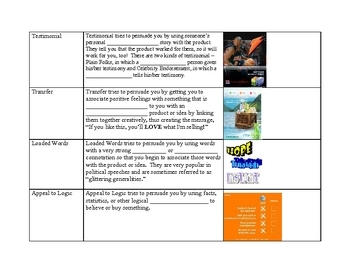 These notes are intended to be used with my Persuasive Techniques PowerPoint with Relevant Examples (See link below); however, I have included a copy with the blanks filled in, if you would like to use them independently of the PowerPoint presentation.